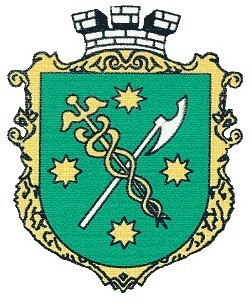 Berdychiv [Бердичів]. Map: IV-9. A city (2012 pop 78,547) on the Hnylopiat River, a tributary of the Teteriv River, in the northwest part of the Dnieper Upland; a raion center in Zhytomyr oblast. Berdychiv was first mentioned in a historical document of 1545. In 1569 the city changed from Lithuanian to Polish rule, and in 1593 a fortress was erected around it. 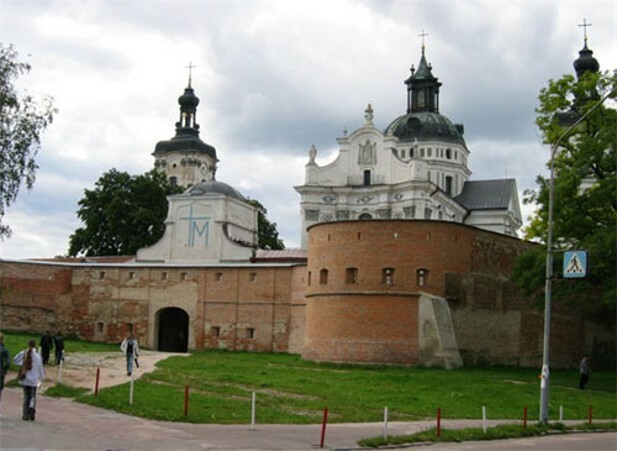 In 1630 the Kyiv voivode J. Tyszkiewicz built a church and fortified monastery in Berdychiv for the Polish Carmelite monks. 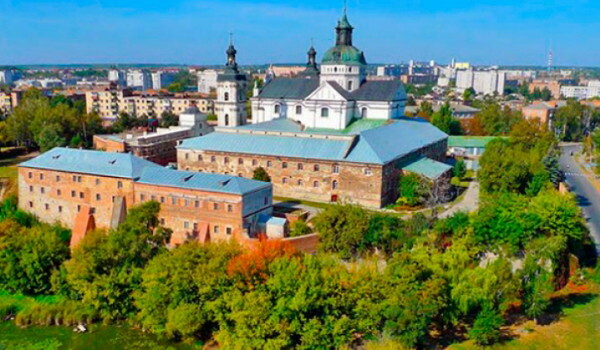 The city thus became an important Polish religious center, attracting pilgrimages to the icon of the Virgin Mary, as well as a cultural center, with a school and, from 1760, a publishing center. These institutions and facilities were suppressed by the Russian government in 1866. 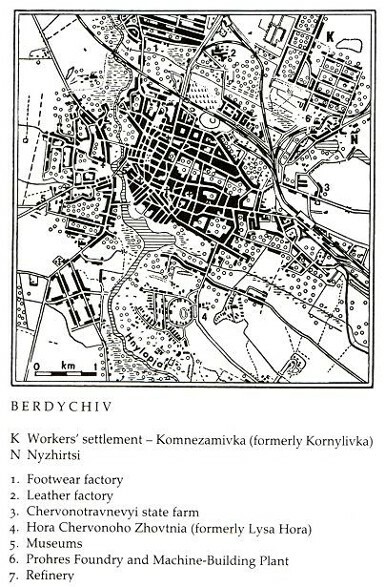 Berdychiv grew in importance in the first half of the 19th century, when it became a center for wholesale and market trade (grain, cattle) and for light industry (dry goods, footwear). 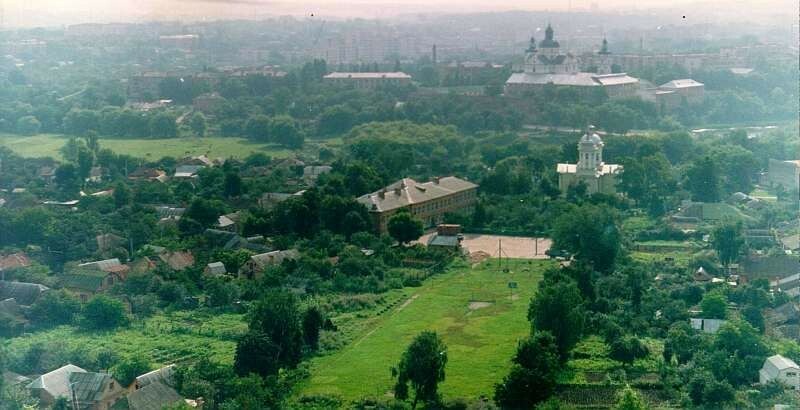 Berdychiv's population grew in response to commercial and industrial development (2,000 in 1789, 19,000 in 1838, and 51,500 in 1860), and it became Ukraine's fourth largest city after Odesa, Kyiv, and Lviv (but before Kharkiv). Berdychiv had a large Jewish population (80–90 percent) and was an important Hasidic center. With the decline of the market trade and with the construction of railroads, Berdychiv's growth ceased temporarily (in 1897 the population was 56,000), coming to life again at the beginning of the 20th century (in 1914—prior to the war— the population was 80,000). From 1917 to 1920 Berdychiv was, for the most part, under Ukrainian rule, but in the summer of 1920 the Soviets took control of the city. By 1920, as a result of the war and the revolution, the population of Berdychiv had decreased to 42,000. By 1926 it had risen to 55,000, with the following ethnic composition: Jewish, 55.4 percent; Ukrainian, 26.4 percent; Polish, 8.5 percent; Russian, 8.3 percent. During the Soviet period industry began to develop in place of trade. At present the main branches of industry are as follows: machine building (in the Prohres chemical plant and the Komsomol machine-tool construction plant), the food industry (sugar-refining factories, etc), and light industry (footwear industry). Recent population statistics are as follows: 62,000 in 1939, 53,000 in 1959 (ethnic composition: Ukrainian, 55 percent; Russian, 19 percent; Polish, 14.5 percent; Jewish, 11.5 percent), 71,000 in 1970, and 82,000 in 1981. 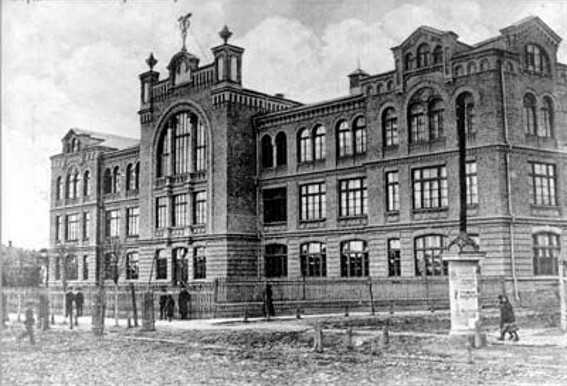 The city has a machine-building tekhnikum, medical college and pedagogical college (a pedagogical institute existed there until 1971), and a school of music. A Ukrainian dramatic theater was active until 1977. 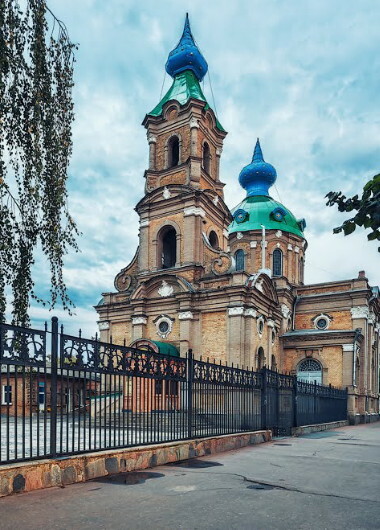 Berdychiv's architectural landmarks include the fortress and a Roman Catholic Saint Barbara's Church (formerly Carmelite), designed by Jan de Witte and constructed in 1739.